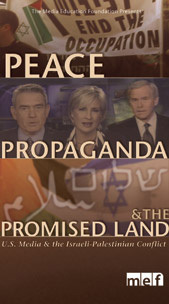 Through the voices of scholars, media critics, peace activists, religious figures, and Middle East experts, Peace, Propaganda & the Promised Land carefully analyzes and explains how--through the use of language, framing and context--the Israeli occupation of the West Bank and Gaza remains hidden in the news media, and Israeli colonization of the occupied territories appears to be a defensive move rather than an offensive one. The documentary also explores the ways that U.S. journalists, for reasons ranging from intimidation to a lack of thorough investigation, have become complicit in carrying out Israel's PR campaign. At its core, the documentary raises questions about the ethics and role of journalism, and the relationship between media and politics. DVD Features:>>2-Disc Set w/ 8 hrs. additional footage!>>Arabic, English, French, Hebrew & Spanish subtitles>>Independent activist video shorts & trailers>>Bonus interviews>>Maps & additional news clips>>Over 400 compiled websites & online resources.